With a wingspan of up to 2.5m, and standing at least one metre tall, the Wedge-Tailed Eagle is the largest raptor in Australia. A lanky bird, it hunts by flying up to 2 kilometres high, circling on thermal air currents for as long as 90 minutes and sailing out over the countryside, covering wide areas . When flying, the wings have distinctive flight tips and its tail fanned and wedge shaped. 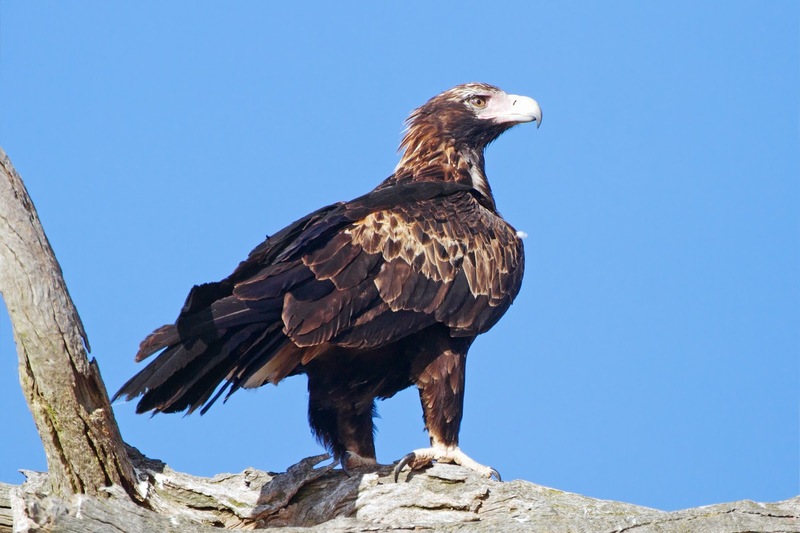 the Wedge-Tailed Eagle is found throughout Australia, including Tasmania and will aggressively defend their territory, even against drones. 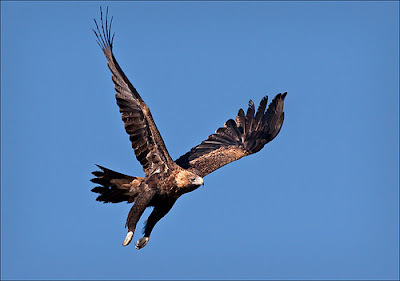 Earlier this century, when eagles were found on dead sheep and lambs, it was thought that they had killed them. All that has stopped once people realized that the eagles usually attack only poor, dying or dead lambs and have little effect on the sheep industry. Today they are protected in all states. This segment won’t be complete without mentioning them at least once every year, because there’s always so much to be said about them. Why? Because we just lover our summer tomatoes that taste better than the store bought ones, and once you get the conditions right, they’re relatively easy to grow. There’s books written about them, they are prone to all sorts of pests and diseases, but every year, we plant them hoping for that ultimate crop. Being in the Solanaceae family, they’re related to eggplants, capsicums, chillies and potatoes. Tomatoes are botanically a fruit, or to be even more accurate a berry, because they are pulpy and have edible seeds. Other botanical fruits classified as vegetables include squash, cucumbers, eggplants, and peppers. The tomato is native to South and Central America, and the first tomato was thought to bear a yellow fruit and grown by the Aztecs. 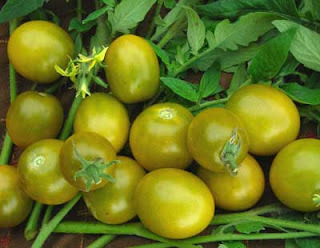 Wild tomato plants are still found in the countries between Ecuador and Chile as well as on the Galapagos Islands, although only two have edible fruit. Did you know that it’s thought that people were growing crops of tomatoes at least around 500 BC? In the mid 1500’s, tomatoes were only grown amongst flowers in Italy. As late as the 18th century, physicians thought tomatoes caused appendicitis, and stomach cancer from tomato skins sticking to the lining of your stomach. Europeans then refused to eat tomatoes because they were thought to be poisonous, and no-one was volunteering to be the first. Why do a lot of store bought tomatoes have little taste? The answer is because it’s a result of breeding tomatoes which ripen uniformly red. This change occurred after discovery of a variety in the mid 20th century which ripened evenly, so was then cross-bred with just about every tomato variety, to produce attractive red fruit without the typical green ring surrounding the stem on uncross-bred varieties. Before the introduction of this trait, tomatoes were able to produce more sugar during the process of ripening and were sweeter and tastier. 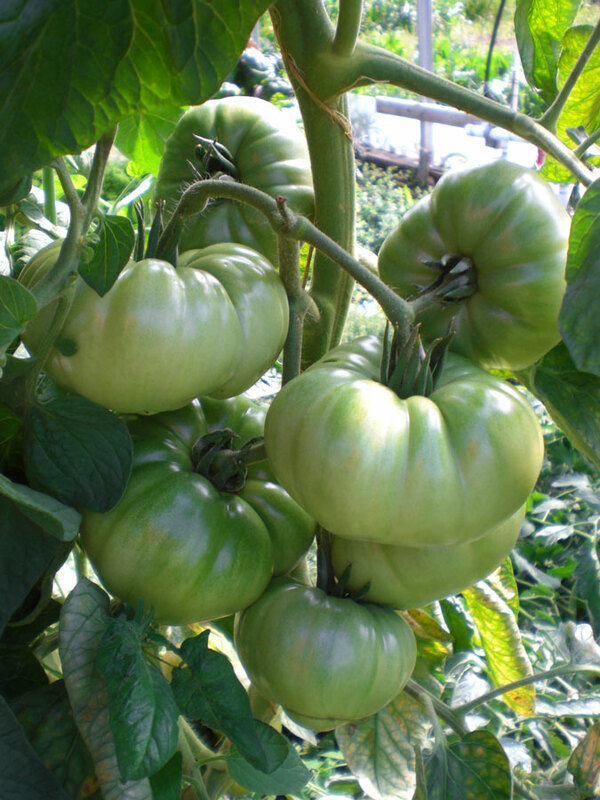 Usually, tomatoes turn red when ripe, but some varieties stay green. These are the ones that we will concentrate on. 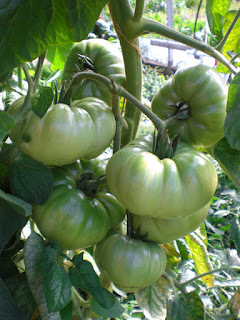 The usual concern or question is, how do you tell when green tomatoes are ripe?. The colour green will change from a very bright green to a greeny-yellow tinge. It’s a subtle change but once you’ve seen it you’ll know that it’s a reasonable difference. 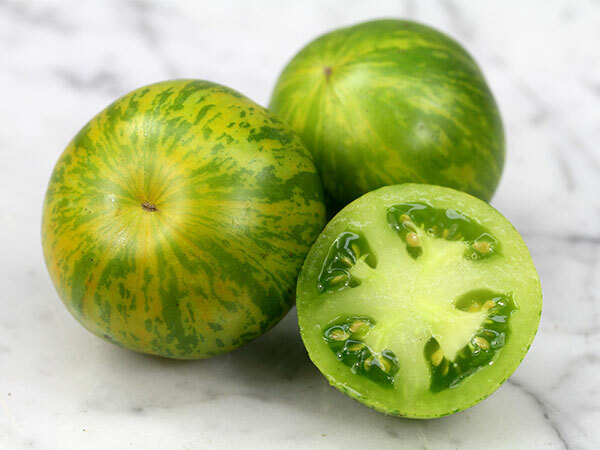 If you’re still not sure how to tell if a green tomato is ripe and not just an unripe fruit, close your eyes and feel it; if it's soft, it's ripe. This is a very productive tomato, about 5 cm’s round that ripens to a beautiful amber gold with dark green zebra-like stripes over the amber background. Inside, the flesh is a beautiful, sparkling green. When those stripes appear, then you know the tomato is ripe. Then there’s Aunty Ruby’s Green, is a luscious green big sweet beefsteaks, bursting with a fragrant, complex, spicy-sweetness with a touch of tang. A gorgeous green-when-ripe colour, this much sought after variety is a real treat to have in your garden, and is said to be the very best tasting green. For the novice gardener this one you might need to tell by feel if it’s ripe though. Another favourite is Green Grape. This one has an olive green skin, but is very sweet with a hint of lemon zest. Last year it won the tomato taste test at the Botanic Gardens in Sydney. A very compact plant ready to eat fruit in 10 – 12 weeks. There’s a tomato for every type of climatic condition and generally they’re a warm season fruit even though we call them vegetables. In temperate climates you can plant them until December, hopefully some of you started them in early September to get the jump on fruit flies. 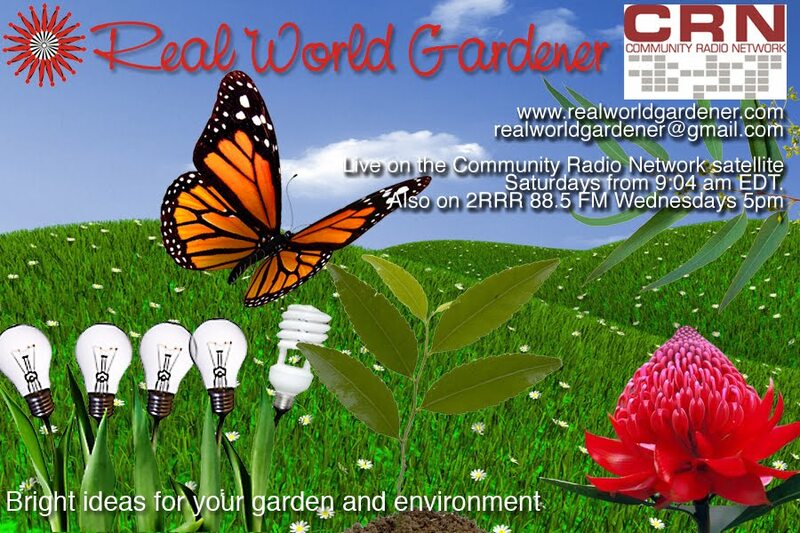 In sub-tropical and tropical areas, this week it’s your turn to win, and yes, you can plant tomatoes all year round. In cool temperate districts you have from October until December, and in Arid areas from August until March, so nearly all year. Tomatoes prefer full sun but if you live in very hot climates, you’ll get sun scald on your tomatoes, so afternoon shade of some sort is essential. Growing tomatoes has to be in full sun at least 6 hours. Tomato seeds can be planted into the ground as soon as the soil temperature reaches 200C. For cool districts I recommend that you start your tomatoes off in punnets of some kind and place this in a plastic bag or mini-greenhouse. Before your transplant your seedlings from the seed tray, and this applies to all seedlings, you need to harden them off. That means taking them out of a protected environment and putting them into 50% shade for a few days. TIP:When you plant your seedling, this is about the only plant I know that you pile the soil higher than it was in the pot-that way, it grows extra roots to support the plant. At the same time, put in a tomato stake of some kind and sprinkle some Dolomite around the plant. ANOTHER GOOD TIP is to put some hydrated or fluffed up water crystals in the bottom of the planting hole, especially if in your district it’s very hot during the day, that it’s sometimes hard to keep the water up to them. They actually need lots of water to prevent a problem called “blossom end” rot, when they get a black bottom. Which also means a lack of Calcium. But you put on the Dolomite didn’t you?. Don’t crowd your tomato plants because they need good air circulation around them so that fungal diseases don’t take hold. When your tomato plant has four trusses (or branches of flowers) nip out top of the plant. By this stage you should have plenty of fruits forming that need to grow and ripen. You could do this mainly because you want the plant to put all its energy into these potentially succulent fruits. And…you don’t want it growing taller than you tomato stake and flopping all over the place. Keep the soil moist by regular watering and using a mulch of some kind. Once the flowers have formed, you need to feed weekly with tomato fertiliser or a general fertiliser but add a side dressing of sulphate of potash. Tomato feed is very high in potash. Be careful not to overfeed as this can lock up other elements in the soil / compost that the plants require. et fruit if the temperatures don’t drop below 210C. Did you know that a tomato picked at first sign of colour and ripened at room temperature will be just as tasty as one left to fully mature on the vine? 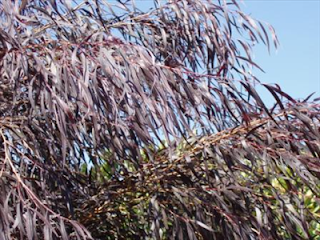 VERY IMPORTANT: Prune off the lower leaves to allow more light, improve air-circulation and prevent the build-up of diseases. For some listeners, fruit fly will be a problem. There are lures and preventative organic sprays that contain Spinosad. I intend to trail fruit fly exclusion bags. As soon as the fruits appear, on they go. First the good news, there have been studies done which show that eating tomatoes lowers the risk of some cancers. Possibly because of the chemical lycopene that is found in tomatoes and makes them red. Cooked tomatoes are even better because the cell walls get broken down releasing something called carotinoids. Eating tomatoes with a small amount of fat, like some olive oil in a salad, allows the lycopene part to absorb better. Tomatoes are highly nutritious and sweet because of natural sugars – sucrose and fructose. If you ate only one tomato a day, you would get 40% of you daily requirements of Vitamin C and 20% of Vitamin A. This series is about garden styles which RWG has visited over the years with different designers. It’s always good to revisit these styles to find out differing views as to what makes up the unique garden styles. You may not have a particular style in your garden but after hearing this series you may want to incorporate some of the plants that make up the various styles. We’re starting of with a cottage garden style. Some of the main ideas of a cottage garden are not dependent on the exact plants but on how that garden is arranged, and how the plants are cared for. Low growing perennials make up the backbone of a cottage garden with some accent plants here and there. But what’s not evident is those clipped shapes but instead plants that are allowed to grow into one another. A cottage garden is known for its pretty flowering perennials. These gardens have a relaxed feeling with their informal style rather than a grand presence. The plants are usually fluffy flowering plants seemingly growing into each other in peaks and mounds. The plantings are rarely in straight lines. Hedges would only be found on the outside or as boundaries of the garden. Narrow winding pathways would meander, allowing visitors to wander and explore the garden. 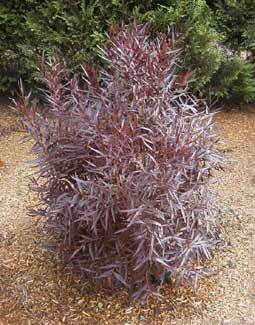 Plants with dark foliage make an attractive statement in any garden. They also break up the amount of green that you have in the garden and provide a striking contrast.. If gardens in England are anything to go by, then you won’t find a garden there without a plant with dark foliage. The people that market plants have their fun though and this one’s ready to party. Willow peppermint or Agonis flexuosa Jervis Bay Afterdark is a slow grower but give it a sunny position and it can take most soil types along the east coast of Australia. Prune it to whatever shape your like or let it grow all wispy and willowy. Just feed it with native fertiliser. If you're wondering how this plant got its name of'Jervis Bay' which is a location in New South Wales while Agonis flexuosa is native to Western Australia. The name marks the nursery where this dark-foliaged selection was made. Most native plants in the 70s and 80's were grown from seed in nurseries around Australia so quite often there were mutations of a variety of species. This was a particular selection that was selected in 1985 as a spontaneous seedling mutation in a flat of Agonis flexuosa grown by R. and M.L. Turner at Jervis Bay Nurseries.